Kumpi's here! Time for a workout! 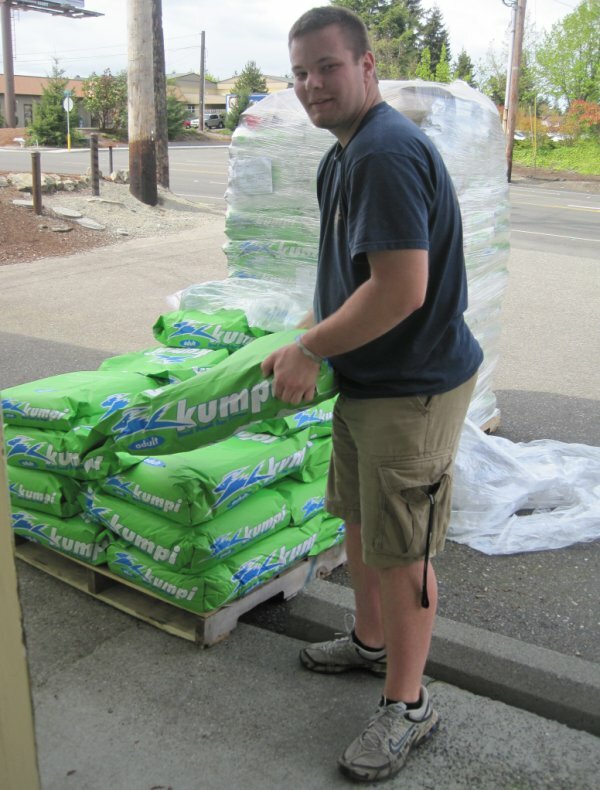 Fort Fido crew member Tim and I unloaded all three tons of Kumpi today, woo-hoo, beats the heck out of P90X hahaha! Time for bed now! Bruiser has met his match with the new pup Romeo! Buddy and Ryker are brothers from another mother lol. Mandy and Allie had their assessment this morning. Although they didn't play (first day jitters), they didn't do half bad. They are characters! 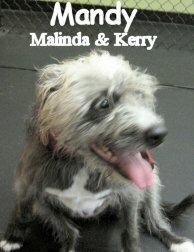 Mandy is a 12 year old, 49 pound, Irish Wolfhound mix. 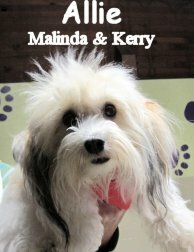 Allie is an adorable Havanese, one year old and eight pounds. We plan on seeing this dynamic duo again soon. Welcome Jaeger, a warning and a cool clip! Jaeger was assessed this morning. Jaeger is a Black and Tan Dachshund, four years old and about 13 pounds. Although he isn't sure what to think of the fort yet, we hope to help him find his groove. He is one handsome weiner dog! Rainier's mom brought the dangers of "Coco Mulch" to my attention. This is good info to know since we all want to keep our pets safe and gardening season is upon us. Thank you Joyce! In other news, Rainier's dad informed me of this awesome YouTube video, I bring you, "Dog versus Deer". Incredible, thanks Colin! 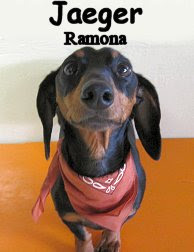 Romeo had his assessment this morning and he did awesome! He is a four month old, 34 pound, Blue Merle, Border Collie. 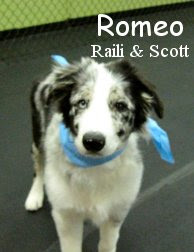 Romeo had an exciting time in the Medium Roll finding a good friend in a Border Collie mix (and Fort Fido veteran) named Lila. We hope to see a lot more of Romeo soon. What a looker! P.S. My Cat Hobbs is up on Kumpi Kids, check him out lol. Thanks Robert! Omar the Dalmatian is more than ten years old and Niko is still under six months, but that didn't stop these boys from having fun! Omar is a slow and gentle "old-folk" most of the time, but when he meets just the right youngster, he likes to bust out all the stops and show us that he still knows how to have fun! Niko, and Australian Shepherd/Shiba Inu mix, is a wild and energetic puppy who likes to run run run with anybody who seems willing to play (even you, if you sit still too long!). PS--Remember that we are going to be closed for maintenance next Saturday, May 1st. 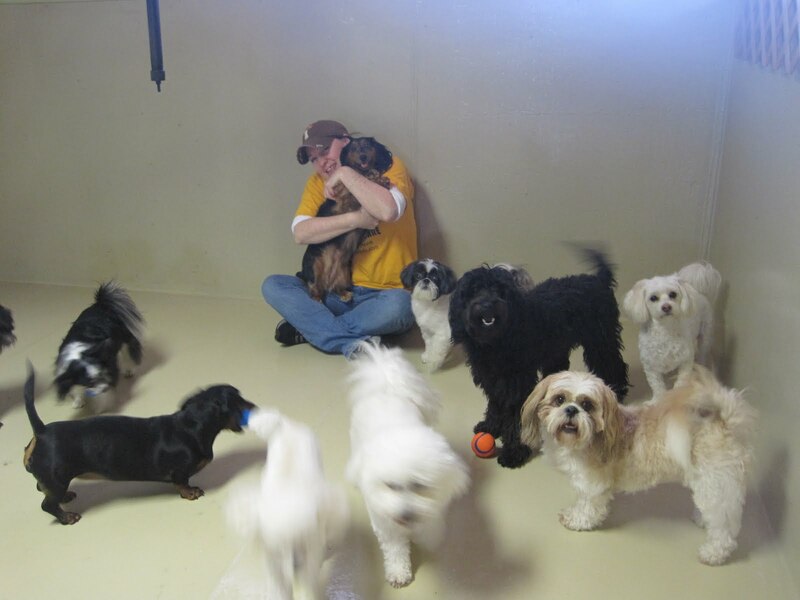 Ma and the Little Roll Gang (she is holding Stella, others in the photo are Buzzette, Boo, Maggie, Sammy, Cody, Sasha, Dixie and Oreo)! A message from Kumpi Kids, "Send in your stories and photos!". "Good morning! Thanks for the link to our site! Your beautiful cat will be up on the site soon. 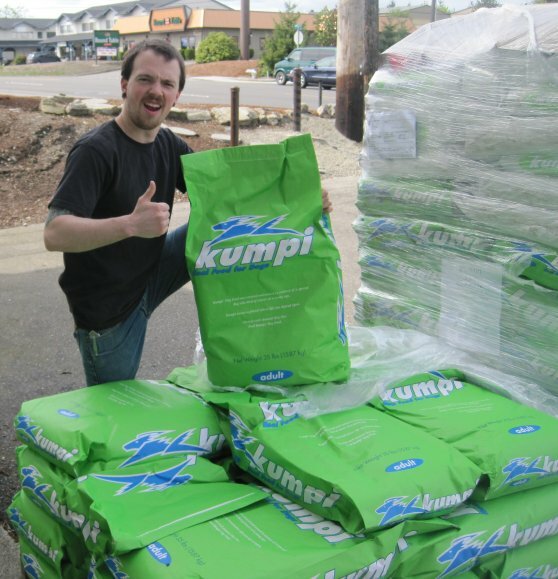 In fact any Kumpi fan can send us photos, stories, videos, etc... and we will be posting them! Just choose the Email Us link at the top of the page and follow the instructions." 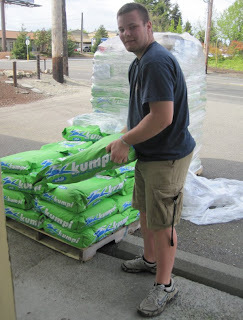 Anywho, I hope some of you out there on the Kumpi train will send in some photos and stories to Robert. Let me know if you do! If you are new to Kumpi check it out, I reccommend calling up or emailing the founder and head cheese Evy (303-693-6533) with any questions or concerns... She is spectacular! This food is VERY hard to beat if you've done your homework. Well, not exactly... Meet Pawsha! 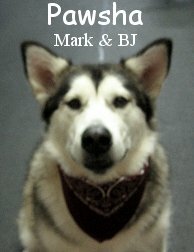 She is a two year old, 100 pound, Alaskan Malamute. Pawsha is doing great, this isn't her first day at the rodeo lol. She has been going to doggie daycare since she was six months old. We are happy to have her as a member of our pack! P.S. Checkout this blog/website... Very cool! I hope to have one of my kitties on it soon. 3 new pups ! ! ! 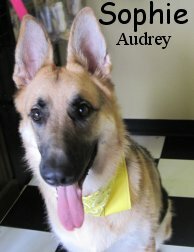 Sophie is a seven year old, 85 pound, Black and Tan German Shepherd. She headed to the Big Roll and did well. Sophie spoke "good dog" and had tons of energy for an older gal. 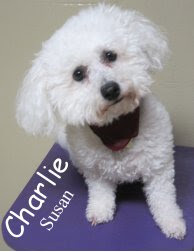 Charlie is a three year old, 15 pound, Bichon Frise. Charlie was sent upstairs to the Little Roll. He got right to work fitting in with the pack. 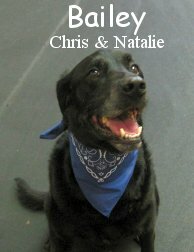 Charlie was a happy, confident, all-around good dog. The third assessment is another cutie named Charlie. 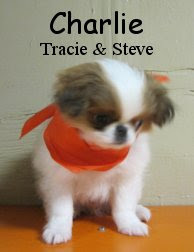 This Charlie is a three month old, two and a half pound, Sable and White Japanese Chin. He is still just a baby, still learning the ropes but we already see a courageous personality emerging. It was a good old eventful morning! Unfortunately I wasn't zoomed in properly on this clip (poor quality) but I wanted to post it anyway. Truman and Osbourne play hard, loose and fast! They are best buddies! Every once in awhile we have to slow them down lol. Here's an eclectic group of dog-related links for today! I found a really neat article about how dog saliva is being used to investigate a possible cure for Cancer. Who knew that all those kisses could potentially be so helpful! Because dogs are one of only a few species that suffer from cancer, researchers think that examining dog DNA in their saliva could lead to some insights about the widespread disease. And lastly, the Eastern Regional division of the Purina Incredible Dog Challenge took place yesterday and today, in St. Petersburg, FL. While I don't know the results from this year yet, you can watch a few episodes from years past on Hulu. The Incredible Dog Challenge includes a variety of activities including Dog Diving, Freestyle Flying Disc, Agility Competition (small & large dog), Jack Russell Hurdle Racing and Weave Poles. I'll end with a picture of Teddy, the Shih tzu/Dachshund mix, and Chloe, the Weimaraner, waiting for me to throw the ball. Chloe was ready to go for it, even though she already had one in her mouth! Welcome Bailey & Boon Dog!! Two new dogs were assessed this morning. 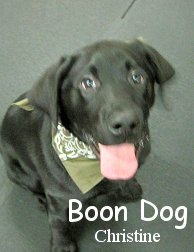 Boon Dog was our second Black Lab assessment today. He is only three and a half months old and weighs around 30 pounds. Boon Dog was started in the Medium Roll, he will most likely head to the Big Roll soon. 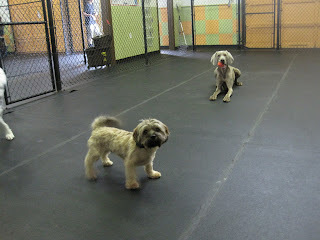 Both Bailey and Boon Dog looked as though they enjoyed their first day at the fort. That makes us happy and we hope to see more of them. Enjoy any sun we get this weekend! McGee busted out today! Here is a clip of him playing well with another Boxer (a female named Sam). Awesome! 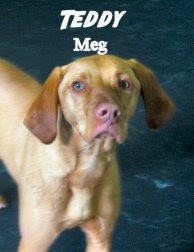 Teddy is an extremely friendly and loving Vizsla that has been coming to Fort Fido for some time now. In this clip, Teddy is having a fun time romping around with Cooper. Angie is one of the Vet Techs next door to us at Fircrest Veterinary Hospital (FYI they offer overnight boarding! :) and she is a Boxer fan! Unfortunately her Boxer passed away last fall.... Fortunately, a customer of hers began to Foster a beautiful Boxer boy that she got to rescue! 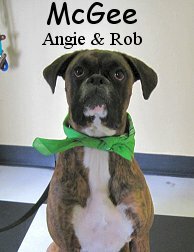 Mcgee is his name, he is a 14 month old, 56 pound, Brindle colored Boxer. He is a big sweetheart! Even though he didn't play today, we believe Mcgee will be busting out with the pack in the Big Roll soon! It is only a matter of time. With summer creeping up on us, thoughts of travel start sneaking into a lot of our heads. Have you ever wanted to go on a trip and bring your dog with you? I stumbled across a neat website today called BringFido, which is a pet-friendly travel directory. It includes listings of hotels, restaurants, and dog-related attractions like parks and beaches. One of the neatest things about this website is that it's information is world-wide! You can find pet-friendly activities for Fido in Australia, Thailand, France, Japan, or anyplace in between. Check out these dogs enjoying Zakynthos beach in Greece! 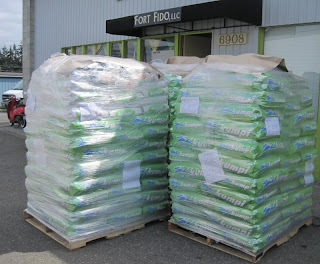 If your pup isn't coming with you, Fircrest Veterinary Hospital next door to the Fort will board your dog overnight. If your dog already comes to the Fort, they can come over to play in the day, and go next door to sleep at night. 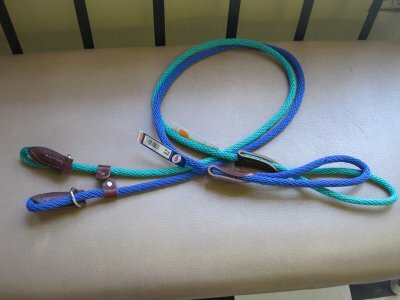 By popular demand we've started carrying the "rope leads", known in the Doggie World as British style slip leads, we use in the day to day operations of the fort. I really like these. They are basically a collar and lead in one, VERY easy on the hands. They come in Red, Green and Blue, check them out! 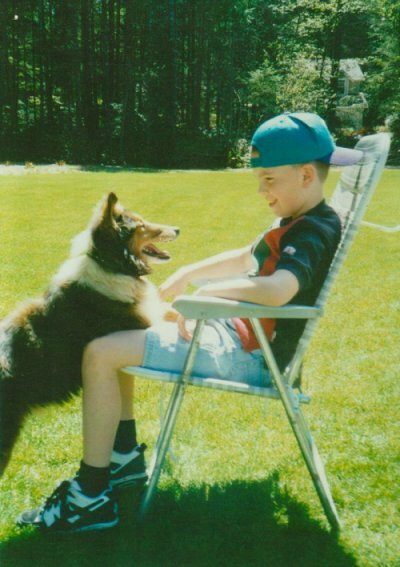 I thought everyone would enjoy this picture of me and my first love Sabrina (Taken around 1993). 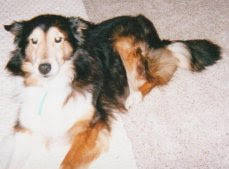 She had a good paw in raising me lol (followed me everywhere until her last days) and there are some funny stories of our antics. Sabrina (a Shetland Sheepdog) was with our family for 13 years and died of natural causes. We planted a beautiful Dogwood Tree in our backyard honoring her. A couple articles of interest today, some sad, some happy. I'm in a Video Clip posting mood... Besides, I know that's what everyone wants to see anyway, forget my ramblings lol, here it is. I've said it before but this clip is Daycare in a nutshell, or at least what we love about it, the dogs having a total blast! Gus (a Bichon Frise / Yorkshire Terrier Mix) is engaging in an epic Tug of war with Barkley the chocolate-colored Mini Poodle. Thought I'd upload three fun clips taken this morning... Two of them are Jake and Bella the Boxer having a good old time (Osbourne our young Chocolate Lab makes an appearance as well) and the third clip is of Mimi (a pretty Chocolate Lab) playing with her love Jersey Boy. Sometimes opposites do attract lol! Luka came in for his assessment this morning and WOW! 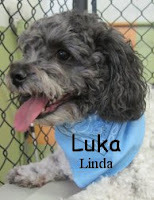 This Bichon-Shih tzu mix was ready to play from the moment he stepped through the door. Big dogs, small dogs, he doesn't care--everybody is good to play with. Here's a clip of him running with Jinx the English Springer Spaniel and Kona the Labradoodle. We definitely would love to see him back! Bailey had her assessment today and did well. 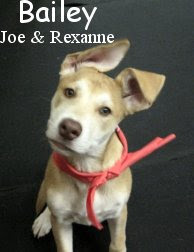 She is a four and a half month old, 30 pound, Labrador Retriever / German Shepherd Mix. Bailey seemed to enjoy the fun of the Medium Roll and her picture turned out awesome! She is a energetic and frisky little gal. Welcome Bailey, we hope to see more of you! P.S. Doesn't Bailey have that Wiley Coyote look about her lol?